One of my oldest memories, is of sitting on the blue and white swing in the room that my sisters and I shared in our grandparents’ house in Thalassery. I spent a good portion of my childhood on this swing, mostly swinging away from the person trying to feed me. Sometimes, during a particularly intense bout of boredom, I’d spin sideways until enough tension built up that as soon as I lifted my feet off the ground, it would spin like a top with me cocooned inside. On one particular afternoon, I was eating lunch sitting on the swing, with a plate of rice and fried seer fish on my lap. I also remember walking to the dining room soon after, and on the way, dropping the plate on my foot and watching in horror and fascination as blood gushed from my big toe. I ‘m not sure when I stopped eating fish, but I suspect it had something to do with this incident. For most of my life, not eating fish has been one of those non-negotiable parts of who I am, like my left-handedness. Hi, I’m Aysha, I’m from Kerala, no, I don’t eat fish. I recently discovered that it’s the fish skin that really throws me off, rather than the actual fish. The slimy texture and that shade of silver/grey that has only now become trendy, (and a much-coveted shade for both couches and phone covers alike). And I suppose without the skin I can tell myself that it’s basically chicken that lives in the sea. 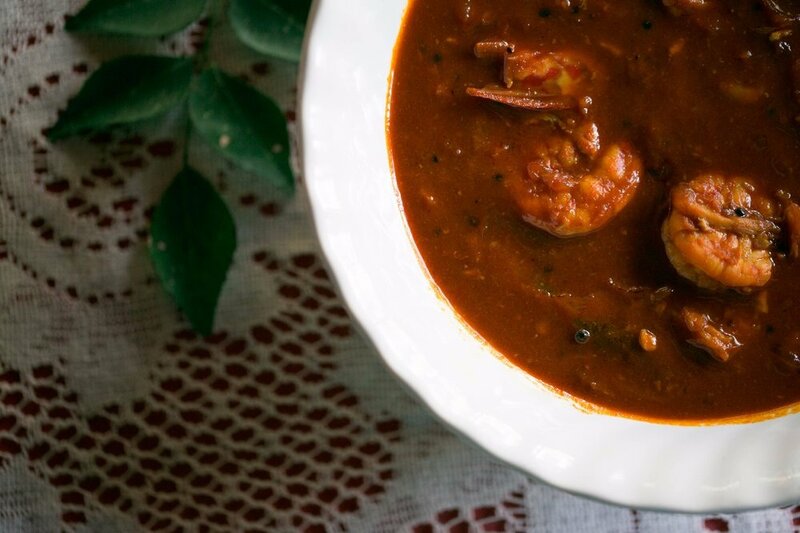 Through my aversion for fish, I have, however, remained a loyal fan of the meen varatiyathe, or simply meen curry, as it is known at home. Meen means fish in Malayalam, and while there are several fish curries in the Mappila/Kerala canon, this is the curry that has the honour of being the fish curry in our house. 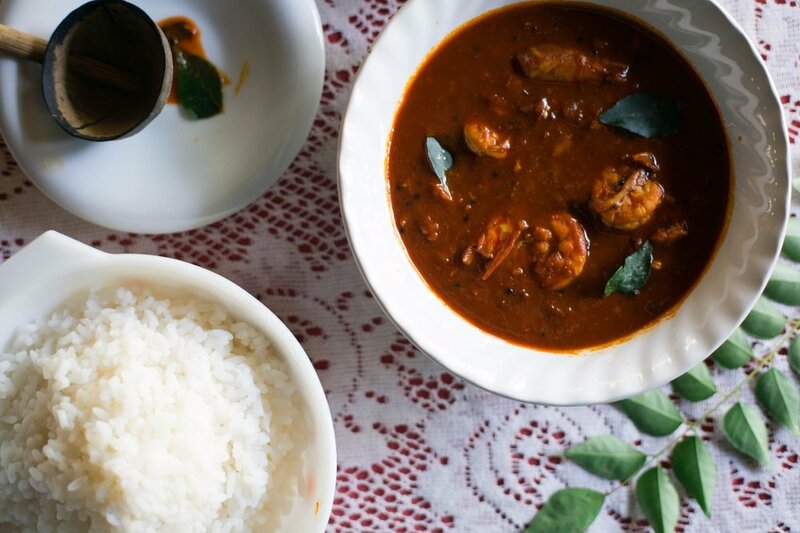 It is served for breakfast, lunch and dinner, and I can’t think of the last time we ate a meal at home without meen curry on the table. Even if it’s spaghetti, there’s fish curry on the side, should anyone want to spice up their pasta a bit, and let me tell you, pasta in white sauce with a little fish curry on the side is inspired. 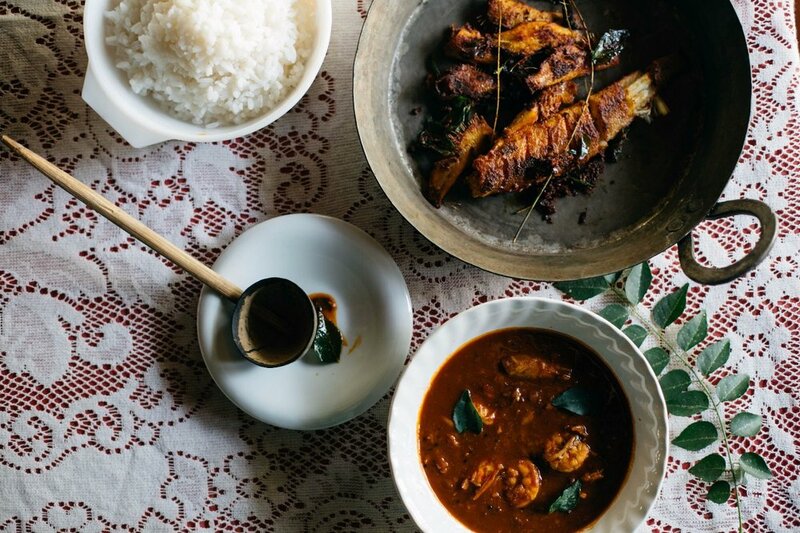 It is the constant in our ever-evolving rotation of meals, and a drop or two is swirled into every curry on your plate, so that even if you start off with a bright yellow dal, eventually, the plate turns to some shade of red. 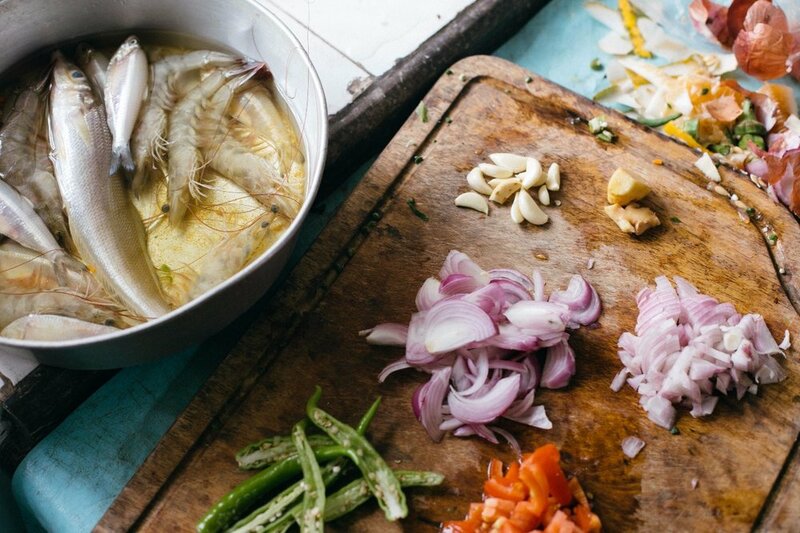 Most types of fish can be used here, mackerel or mathi, seer fish or ayakoora, but I love it best with prawns. 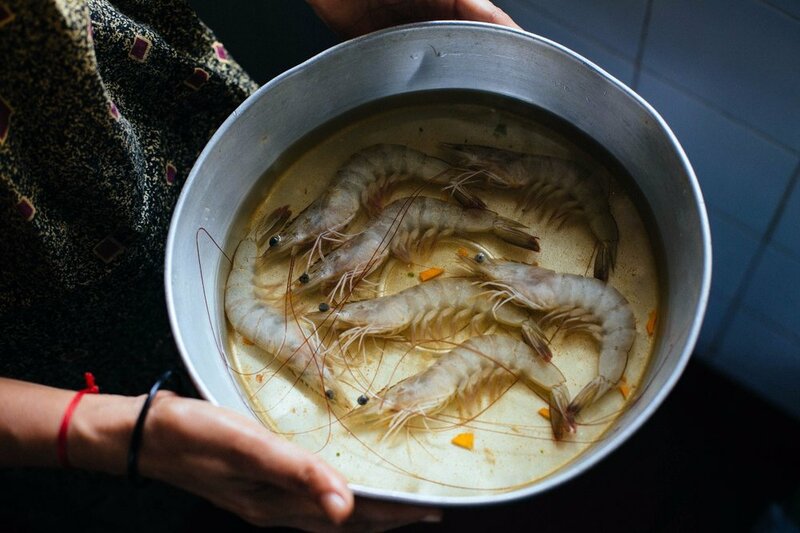 Unlike most other recipes, you’d do well here to use the smallest prawns you can find. At the risk of losing all legitimacy as a Mappila food writer, I want to add that when using mackerel fish, a clove or two of crushed garlic is a wonderful addition. No, it is not traditional, but neither are all the clever uses you’re going to find for it, like drizzling it over fried eggs, eating it with folded into fried rice, or dragging the last bits of your roast chicken through it. Think of it as a condiment, our version of ketchup, had ketchup been invented in a sea-side town with a penchant for deep, earthy flavours and an aversion towards tomatoes. Mix the turmeric and chilli powder in ¼ cup water, so that it forms a thick paste and set aside. In a heavy-bottom pot on a medium flame, heat the oil. Add the mustard seeds and wait for it to splutter. Now add the fenugreek, curry leaves, and green chillies. Sauté for a minute or two, until fragrant and add the onions. Sauté until the onions turn translucent. Add the chilli and turmeric paste to the onions and mix well. Continue sautéing until the oil rises to the top. Be patient, this will take a good 5 minutes. Now add the hot water and when it comes to a boil, add salt to taste, ginger and garlic. Let it boil for 5-6 minutes, until the oil once again rises to the top. Pour in the tamarind water and let it boil for another 2-3 minutes. Finally, add the prawns and let it cook for 5 minutes, or until the gravy reaches a consistency of your liking.